Earlier this month, the amazing people at Pinterest emailed us saying that you Pinners are lovin’ yellow wallpaper right now. Who can blame you? Yellow is such a cheerful colour, why not create a statement wall with such a wonderful colour? Amongst sunflower field pictures and sunsets, we have an array of yellow wallpapers that can help you achieve this top interior trend. Whether your home style is pretty florals or abstract patterns, we’re sure to have a design for you. 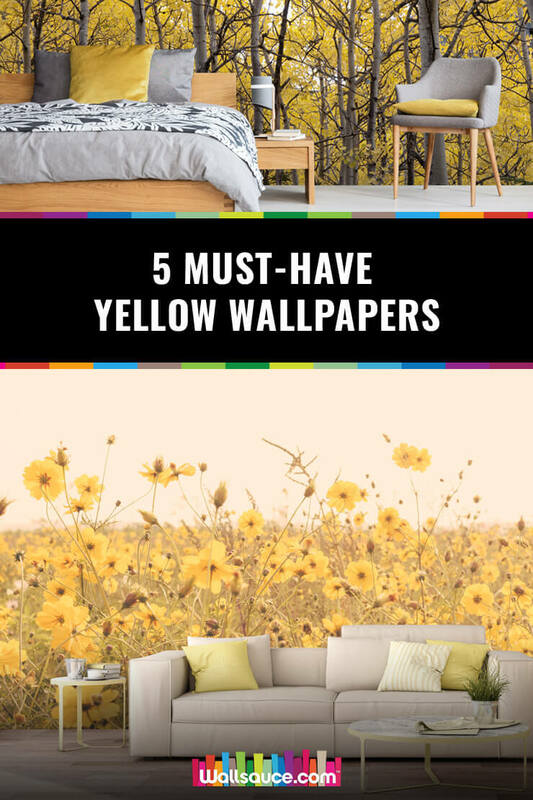 In this post, we’ll be saving you the hassle of searching for your perfect wallpaper and introduce you to our five must-have yellow wallpapers. We couldn’t write a blog post on yellow wallpaper and not talk about sunflower wallpaper! Here’s a fact for you, did you know that there are around 70 species of sunflowers? Yup! The most common species that are probably most familiar with you and I is known as the ‘Helianthus Annuus’. Featuring beautiful, bright yellow ray florets that stand tall on a sturdy stem, these spectacular flowers are perfect for creating a statement. Just like the sunflower, yellow is the colour of youthfulness! 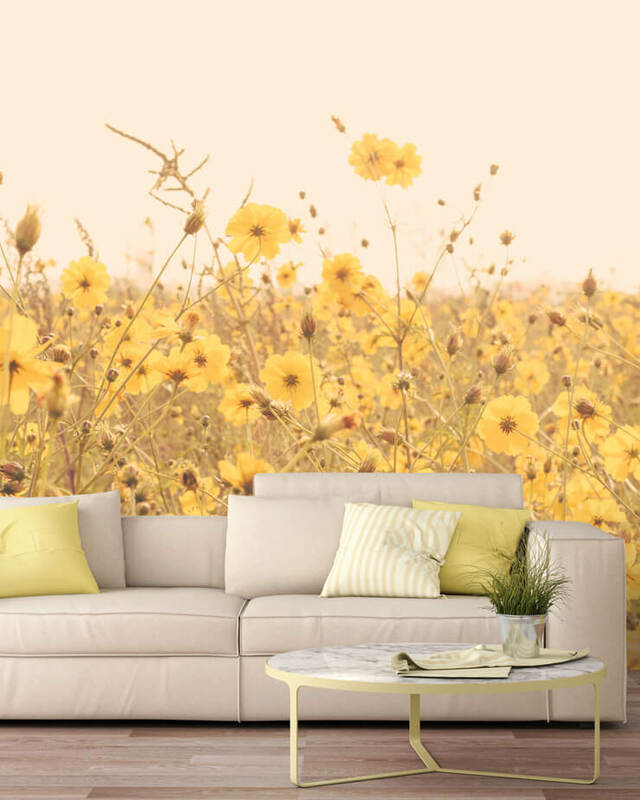 In our collection of eleven, made-to-measure sunflower field wallpapers, you’ll discover this striking ‘sunflower’ mural captured through photography. Whilst we’re on the subject of floral wallpaper, our next introduction is this beautiful ‘vintage yellow floral meadow’ wallpaper. 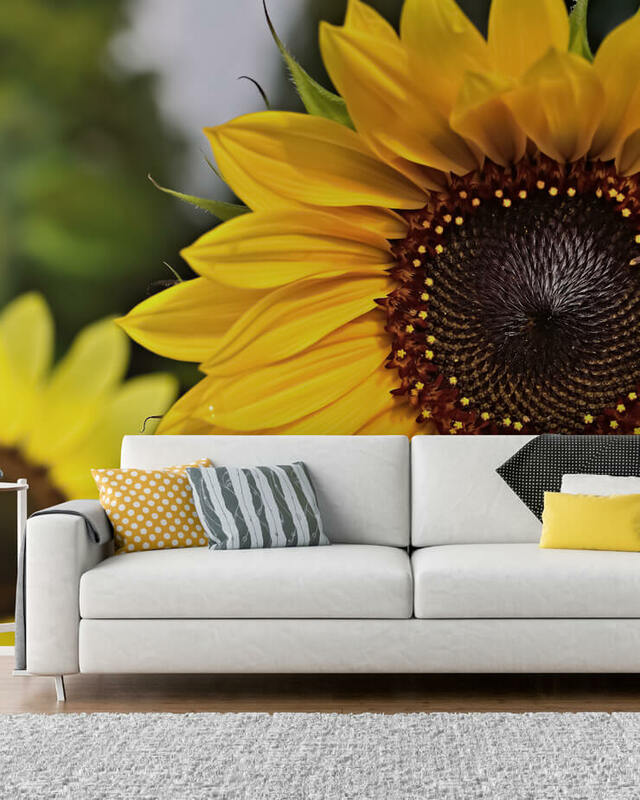 With a filter-style look, it’s more mellow than a sunflower mural so is great for creating a more calming living space. Team this yellow wallpaper with soft furnishings to give your room a cosy feel. It has to be a fact that tree wallpapers can work in any room! They’re an easy way to fill a dull, boring wall with a fresh design. 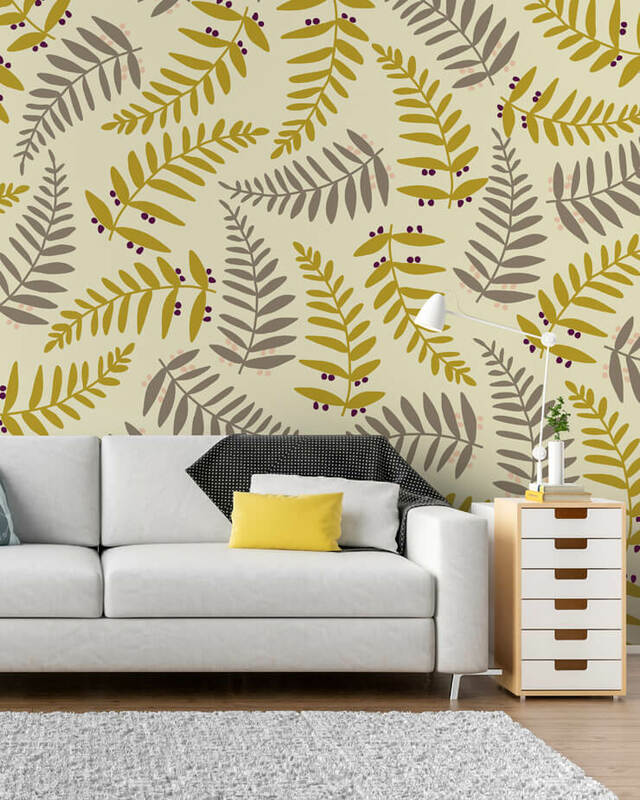 In our extensive range of tree wallpapers, you’ll discover this eye-catching yellow tree wallpaper. A favourite asset of this wallpaper is that it features three clear colours. The off-white and brown tones balance the vibrant yellow making this a crisp design that will also be very simple to style! 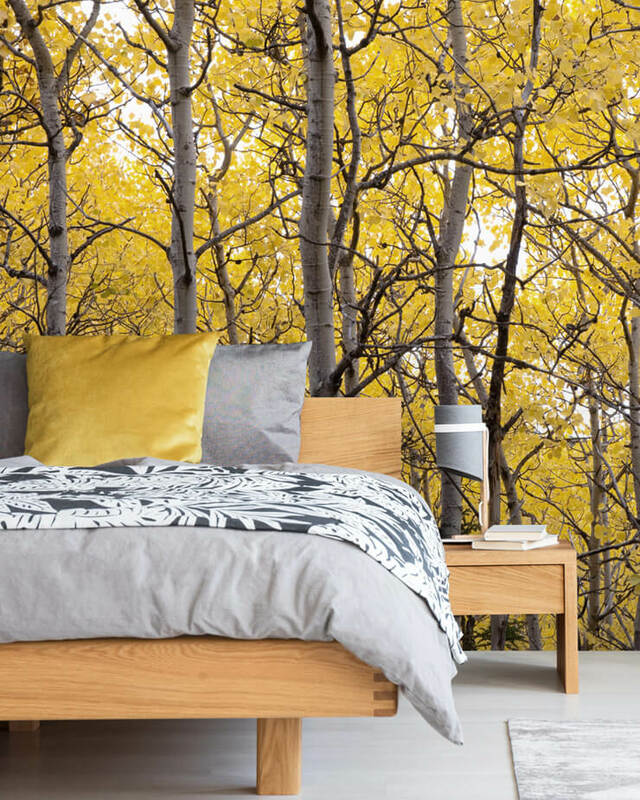 So far, we’ve shown you some very natural, scenic designs but our yellow wallpapers don’t just stop there! Take a look at this abstract wallpaper. Not one for the faint-hearted, this striking yellow wallpaper will not only bring colour to your space, it will also add a sense of texture. Taken from our wallpaper collection by Studio Arterie, this edgy design is available in alternative colour schemes. Patterned wallpaper is an all-time favourite. It’s probably a style we’re most familiar with, yet has come a long way through the decades. This beautiful yellow patterned wallpaper by The Tiny Garden is simple and sophisticated and will look great in a grown-up living room. We hope we’ve inspired you to embrace this interior trend! 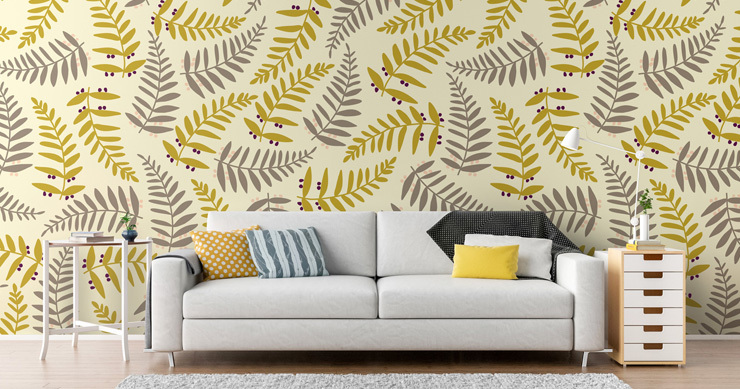 Don’t forget that all of our yellow wallpapers are available for print onto a removable wallpaper – great for rented homes! If you’d like to share your tips on adding a touch of yellow to your décor, please feel free to comment below. 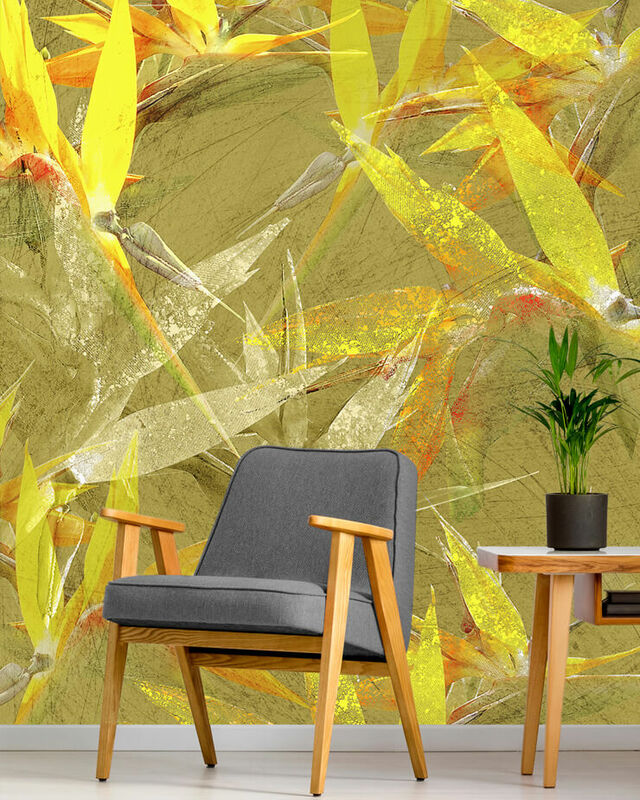 Alternatively, you may like to browse our full collection of yellow wallpapers. Thank you so much Nicholas! It's great to hear you like our blog and wallpapers!